This design puts a modern twist on traditional. The U-shaped staircase and kitchen counters are used as dividing elements in this otherwise open plan. A vaulted two-story ceiling heightens the great room, while built-ins embrace the fireplace. French doors lead to the deck, and a bonus room enables growth. 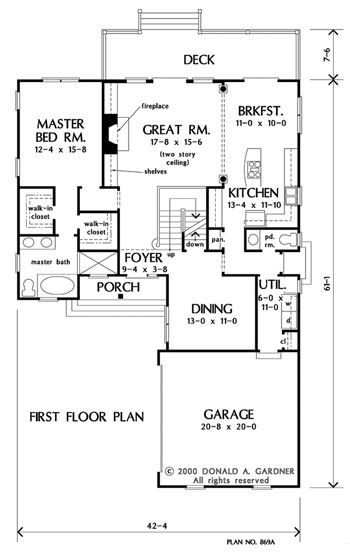 1st Floor: 1499 Sq. 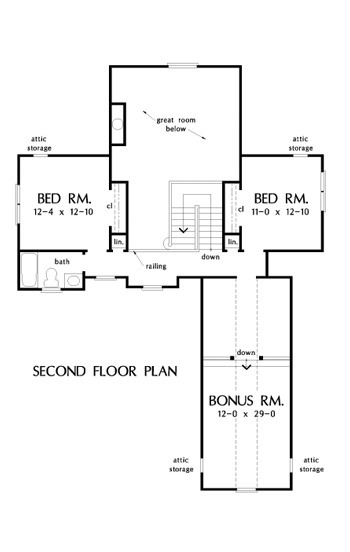 Ft.
2nd Floor: 534 Sq. Ft. Bonus Room: 373 Sq. 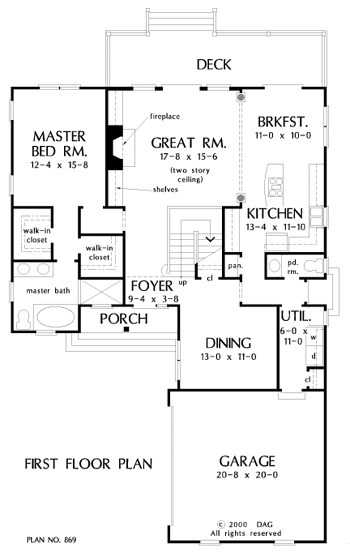 Ft.
House Dimensions: 42' 4" x 61' 2"
Great Room: 17' 8" x 15' 6"
Master Bedroom: 12' 4" x 15' 8"
Foyer : 9' 4" x 3' 8" x 9' 0"
Dining Room : 13' 0" x 11' 0" x 9' 0"
Great Room (2 Story): 17' 8" x 15' 6" x 18' 0"
Kitchen : 13' 4" x 11' 10" x 9' 0"
Breakfast Room : 11' 0" x 10' 0" x 9' 0"
Utility Room : 6' 0" x 11' 0" x 9' 0"
Bonus Room (Vaulted): 12' 0" x 29' 0" x 8' 0"
Garage : 20' 8" x 20' 0" x 0' 0"
Master Bedroom : 12' 4" x 15' 8" x 9' 0"
Bedroom #2 : 12' 4" x 12' 10" x 8' 0"
Bedroom #3 : 11' 0" x 12' 10" x 8' 0"
Porch - Front : 13' 0" x 3' 6" x 0' 0"
Porch - Right : 2' 8" x 3' 4" x 0' 0"
Deck / Patio : 29' 8" x 7' 6" x 0' 0"
Balcony : 3' 4" x 13' 0" x 8' 0"